One of the problems of transit is topography. 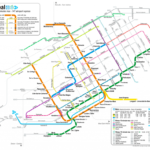 How can you provide good transit service where the population density is too low? Ideally one would want good service throughout the network, but of course that’s not affordable. On the other hand these areas still need access to public transportation. So there will always be a fair amount of transit service running at low frequency. But how can you get people to switch from cars to transit (or more importantly, not switch from transit to cars) if you cannot provide frequent service? Most people will not take the bus to save the planet, but they will if it provides similar (or better) mobility as the car. One way to lose riders to the car is by not providing timed connections. Many services in low density areas are actually feeder lines to more frequent lines, rapid transit lines or commuter trains. If a connection can not be ensured, then the transit agency will lose riders. This seems really obvious, but it’s something that some transit agencies fail to enforce consistently, especially across different agencies. Case in point: recently a friend of mine bought herself a house and moved into the suburb city of Laval, just north of Montreal. Naturally I asked her how she gets downtown for work (who wouldn’t? ), and to my relief I found out she takes the commuter train. She did complain about the bad connection to the bus, which supposedly makes her wait for an hour at the train station all the time — both the train and the bus are infrequent; they come about hourly. It turns out that the bus often leaves a couple of minutes before the train arrives. This is especially true when going home in the evening. The only short connection during the whole evening is exactly 1 minute, so it’s likely that a passenger will still be stranded for an hour. The bus and the train both come about hourly, and the bus has its terminus there, meaning that the connection is important for that line. 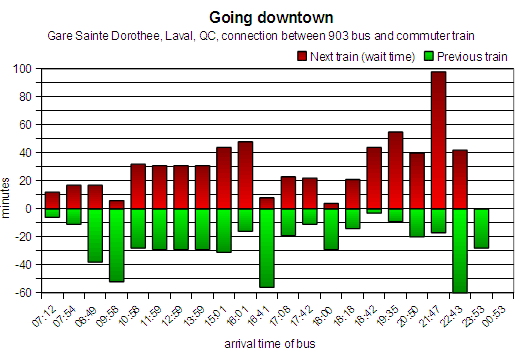 The graph shows, for every train arrival, when the next bus will arrive and also when the previous bus left. Ideally the connection should always be like in the morning. The other way the wait is not quite as long, but it seems the bus is scheduled to arrive half-way between the trains. 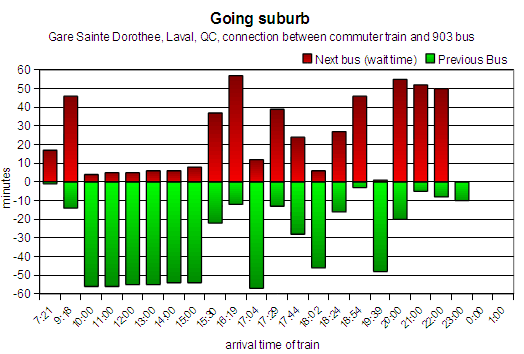 This sort of scheduling problem is not just a fluke, it’s an example of a larger problem in the Montreal area. 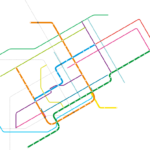 According to a recent article in the Montreal Gazette, up to 19 transit authorties and regional/municipal bodies are involved in planning. Additionally, Aéroports de Montreal, which runs the Trudeau airport, is pushing it’s own transit agenda to create a non stop rail shuttle to downtown. Currently it looks like their option is going to be chosen, rather than the more integrated plan of the AMT (agence metropolitaine de transport) to create a surface metro in the badly served West Island. With all these agencies, it is no wonder that there are issues with planning, fare zones, and, well, scheduling. Bad schedules in particular are mostly due to organizational issues, not due to lack of actual transit resources. These issues could be solved with more cooperation, without actually having to increase service. 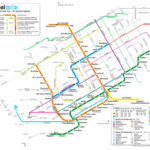 For such infrequent service, schedules make or break the whole transit network. And it is supposed to be a network, not just a set of badly connected infrequently served lines. I wonder how many more connections are this bad, and whether an individual can do anything to get this fixed. But in the meantime my friend is being pushed into using the car by transit agencies that do not cooperate. I hope you realize that the 76 and 402 buses also run from your friend’s neighbourhood to the train station.